Recently Gael uploaded the "Chest" parts for InMoov. Among all the parts the plexus is made of two parts with the words "InM" and "oov" on them. To create these parts he used a boolean operation in Blender. But Blender didn't do a good job and the resulting parts were full of small artifacts and "spikes". So I asked Gael if (hopefully) he still had the parts BEFORE the boolean operation. It meant I had to clean up the mesh before to perform a new boolean. 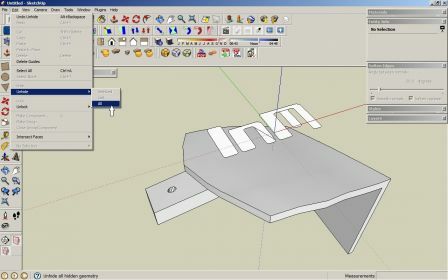 This tutorial assume that you have a minimum knowledge of the SketchUp tools. Because it's mainly a "graphic tutorial" with a minimum of text. At least you should now how to select things with a rectangle either going from right-to-left or left-to-right and by triple-click. First I import the STL in SU. You will need Jim Foltz's STL importer to do that. 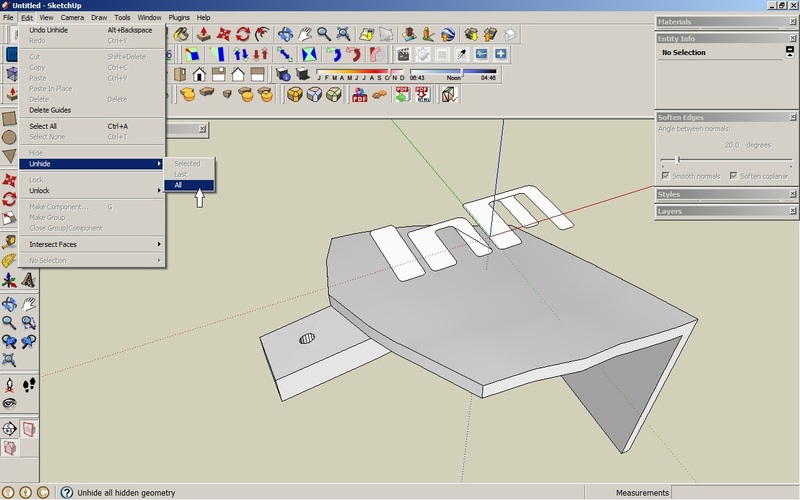 I prefer to work in meters with SketchUp because it has been designed to deal better with big scale meshes. It was initially intended for architecture modeling. So you might want to import the part in "meters" unit. As you can see there's a lot of "spikes" that have been generated by the boolean operation in Blender. So the idea is to completely reconstruct the top surface without the letters and to do a complete new boolean operation later. EDITED : TIG has finished a release 1.1 of the plugin I needed so it's now possible to apply it at this stage. The part is now clean and smooth. are available in my InMoov download section. They are not exacly the same one as what can be obtained by following the tutorial because I have made them with a slightly different method. Before step 11 I have divided all the boundary edges and made sure to have an equal number of segments (edges) on all sides. Then the triangulation made by Curviloft is even better ! So the parts available for download are better subdivided and have a better triangles distribution. In a previous version of that tutorial I wanted to not use the plugin "Curviloft" to show you how to do step 11 by hand. So I had a discussion about that with Frenchy Pilou, and Pilou succeeded in convincing TIG to develop such a plugin. The plugin TIG is working on is here.